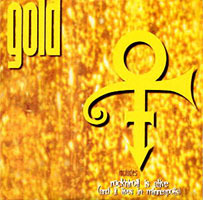 Gold was the second commercial single to be released from Prince's 17th album The Gold Experience, the first album to be credited to . It was released two months after the album, and was released worldwide. The previously-unreleased b-side, Rock 'N' Roll Is Alive! (And It Lives In Minneapolis), received some press coverage as it was hastily-written and recorded as a response to Lenny Kravitz's hit song Rock And Roll Is Dead. The single reached only number 88 on the US Billboard Pop Chart, and number 92 on the Billboard R&B Chart. The single fared much better in the UK, where it reached number 10 on the Gallup Top 40 Singles Chart. This page was last modified on 5 April 2019, at 14:48.